Biography: Han-Xiong LI (S’94-M’97-SM’00-F’11) received his B.E. degree in aerospace engineering from the National University of Defense Technology, China in 1982, M.E. degree in electrical engineering from Delft University of Technology, The Netherlands in 1991, and Ph.D. degree in electrical engineering from the University of Auckland, New Zealand in 1997. He is a professor in the Department of SEEM, City University of Hong Kong. He has a broad experience in both academia and industry. He has authored 2 books and about 20 patents, and published more than 200 SCI journal papers with h-index 42 (web of science). His current research interests include process modeling and control, system intelligence, distributed parameter systems, and battery management system. Dr. Li serves as Associate Editor for IEEE Transactions on SMC: System, and was associate editor for IEEE Transactions on Cybernetics (2002-2016) and IEEE Transactions on Industrial Electronics (2009-2015). He was awarded the Distinguished Young Scholar (overseas) by the China National Science Foundation in 2004, a Chang Jiang professorship by the Ministry of Education, China in 2006, and a national professorship in China Thousand Talents Program in 2010. He serves as a distinguished expert for Hunan Government and China Federation of Returned Overseas Chinese. He is a Fellow of the IEEE. Biography: Everett X. Wang received the BS from Peking University in 1982. In 1986 he received the MS from Institute of Theoretical Physics, Academy of Sciences of China and Ph.D. from University of Texas at Austin in microelectronics in 1993. He then joined Intel Corporation as Sr. Engineer, Staff Engineer and Sr. Staff Engineer, working on stress modeling, quantum tunneling, quantum size effect, 3D mesh generation, hydrodynamic and Monte Carlo models. In 2000 he transferred to Photonic Technology Operation in Intel as a program manager for thermal optical switch products. In 2003 he joined Design Technology Service of Intel as team leader working on hole mobility under arbitrary stress using 2D quantum transport and Monte Carlo method. In 2006, he founded a high-tech startup for developing energy efficient transportation systems. Since 2011, he has been with Guangdong University of Technology as 100-talent-plan distinguished professor. 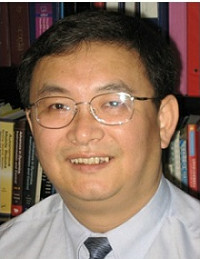 Dr. Wang authored and co-authored 54 journal and conference papers. He also holds 34 approved and pending patents. Dr. Wang's interests include receiver and system design for global navigation satellite systems, transport models for advanced electron devices, modeling and control of robotic systems as well as deep learning in medical applications. Biography: Dr. Chun-Yi Su received his Ph.D. degrees in control engineering from South China University of Technology in 1990. After a seven-year stint at the University of Victoria, he joined the Concordia University in 1998, where he is currently a Professor of Mechanical and Industrial Engineering and holds the Concordia Research Chair in Control. His research covers control theory and its applications to various mechanical systems, with a focus on control of systems involving hysteresis nonlinearities. He is the author or co-author of over 400 publications, which have appeared in journals, as book chapters and in conference proceedings. In addition to his academic activities, he has worked extensively with industrial organizations on various projects. Dr. Su has been an Associate Editor of IEEE Transactions on Automatic Control, IEEE Transactions on Control Systems Technology, Mechatronics, Control Engineering Practice, and several other journals. He has served as Chair/Co-Chair for numerous international conferences. Biography: Dr. Fang Tang is the Chair and Professor in the Computer Science Department at California State Polytechnic University Pomona (Cal Poly Pomona). She joined Cal Poly Pomona in Fall 2006 as an Assistant Professor and was promoted to Associate Professor in 2012 and Professor in 2017. Dr. Tang received her PhD degree in Computer Science in 2006 from The University of Tennessee Knoxville (UTK), performing her research on multi-robot systems. She received her MS degree in Computer Science from UTK in 2003 and her BS degree in Computer Science from Sichuan University in 2000. Dr. Tang is the founder of the Intelligent Robotics Lab (IRLab) at Cal Poly Pomona. Her research interests include multi-robot systems, human-robot interaction, unmanned systems and educational robotics. Her dissertation research on ASyMTRe, a system for automating solution generation for multi-robot teams, is widely recognized by the multi-robot research community. In recent years, she extended her research in unmanned systems. In collaboration with faculty from the College of Engineering, she has obtained funding from the National Science Foundation and Northrop Grumman Corporation to support their research in unmanned technologies. She has over 30 referred journal, conference papers, book chapters and presentations. About 400 citations on Google Scholar.